Refrigerant leak detectors allow you to find leaks in cooling systems, such as those found in HVAC systems or walk-in coolers. Refrigerant leaks are health risks that mean your cooling system isn’t working properly (Source). By that, they release harmful chemicals (Source) like hydrofluorocarbons (HFCs) into the atmosphere. Refrigerant leak detectors are an essential part of an HVAC technician’s toolkit, but business and homeowners also invest in these high-tech ways of making sure their property is protected and chemical-free. There are different types of refrigerant leak detectors, some of which are designed for specific types of refrigerants. 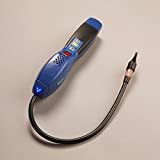 So, to help you choose the right technology to detect leaks in your type of cooling system, here are specs and reviews of five top-rated refrigerant leak detectors. Affordable, compact, lightweight, and remarkable with sensitivity, this product is designed to work continuously to detect leaks in freezing and air-conditioning systems. In this regard, the detector is meant to respond to the presence of any halogenated refrigerants, including the ones containing fluorine and chlorine. Prior to using the detector, you are required to reset it. That takes about two seconds. After that, the unit will require about six seconds of warming up. As such, it takes no time to set up the device and detect a leakage. Additionally, the detector runs on two alkaline batteries and weighs about 0.6Kg. Hence, it is portable and easy to carry around. Here is another high-sensitivity, fast operation, and portable yet affordable refrigerant detector. Though priced below $30, this product has been proven to be effective at detecting a leakage of any halogenated refrigerant. As a matter of fact, the product boasts a maximum sensitivity of 6 g/yr. Hence, you will be able to detect all halogen leaks, ranging from R11 to R404a. Additionally, it is also adjustable. For instance, it allows you to customize its real-time sensitivity. As such, the product will automatically adjust its sensitivity up to the maximum detecting capacity. Moreover, for enhanced efficiency, this detector is equipped with a flexible probe. This makes it easier to detect leaks in the hard to reach spaces and corners. If a leak is detected, the flashing light and siren sound alarm system of the detector will go off. 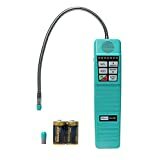 If you do not mind spending more money in a refrigerant leak detector, you should consider investing in the Fieldpiece Heated Diode detector today. This product has one of the best heated diode sensors in the industry today. As such, it is capable of detecting all HFC, CFC, and HCFC leaks, including their blends. Moreover, this product also offers a visual concentration display alongside an audo alarm. It features a filter at its detection tip for protection against debris and moisture as well. To detect refrigerant leaks, this product relies on the sensitivity of its electrochemical sensor. This ceramic substrate sensor is doped with a reactive element. For superior sensitivity, the element is maintained at a relatively high temperature by a built in element. When halogen containing gases come into contact with the surface of the sensor, the halogen atoms are separated and ionized. This causes a flow of electrical current towards a central collection electrode. Basically, the product has been proven to be effective at detecting such refrigerants as R22, R410A, and R134A. 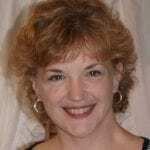 If you are not working on a limited budget, you should consider going for the best solid electrolyte sensor technology. This product is designed to reduce heat and prolong the life of its sensors. Most of the users of this product have expressed their satisfaction with its high sensitivity and exceptional efficiency. 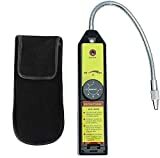 In this regard, the accuprobe of the product is very accurate and fast at locating leaks. Currently, there are several types of refrigerants being used in various heating and cooling systems. Owing to the different characteristics of the various refrigerants, there is no one particular method that may be used to detect the presence of all refrigerants. This being the case, different methods may be used to detect a leakage of the various refrigerants today. The mechanical refrigeration ANSI/ASHRAE 15 Safety Code in the USA and Canadian CSA B52 Mechanical Refrigeration Code state the particular requirements the various detectors are required to meet. For instance, any system that has to be housed within a Class T machine room or exceeds 100 HP is required to have a refrigerant detector. Depending on the type of refrigerant they are used to detect and their mode of functioning, detectors may be categorized into several groups. 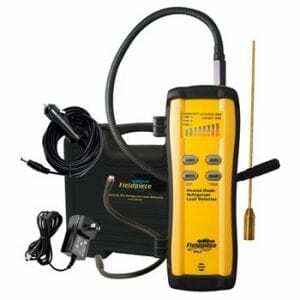 These are some of the most common types of leak detectors in use today. Such products range in terms of features and prices. These detectors use a heated ceramic diode. Whenever the diode comes into contact with halogenated gases, it generates an electrical current that triggers the alarm. Such sensors are sensitive to moisture and oil contamination. The cheaper heated diode detectors are known to give false alarms and work best with R134a. Under normal circumstances, they should be replaced after every 100 hours. Meanwhile, the more expensive ones feature an inbuilt sensitivity check for enhanced accuracy. These are designed to pull air through a corona discharge — electrical field — wire. Any presence of a refrigerant in the air will change the current within the wire. This, in turn, will trigger an alarm. The downside with such detectors is that they are not compound specific. As such, they are likely to give false alarms from time to time. These are designed to detect the sound waves generated when a vacuum or gas escapes through a small orifice. They will pick up such sound waves and amplify them to an audible range for human ears. 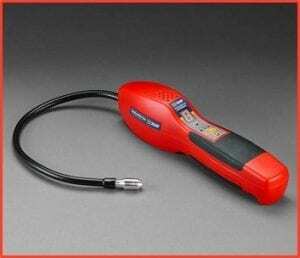 Hence, owing to their mode of functioning, these detectors may be used to detect different refrigerant leaks, including HC refrigerants and nitrogen leaks. This type of electric refrigerant detector features an optical bench. When a refrigerant passes through the bench, it absorbs IR radiation. This is then detected by the optical bench and an alarm is triggered. The amount of alarm generated by this system will depend on the amount of IR radiation absorbed. Such systems use an additive that is normally added to the oil. As the oil circulates in the system, the ultra-violet (UV) radiation of the additive will be detected at the point of leakage. Basically, they comprise of additive injection kits, polarizing goggles, and a UV lamp. When it comes to detecting HCFC and CFC refrigerant leaks, halide detectors are some of the most effective types of detectors. They are powered by butane and function like Bunsen burners. However, the by-products of the burning process are highly toxic. As such, it is not advisable to use halide detectors with HCs or HFCs. Choosing the right detector for each application is important when it comes to the effectiveness of the detector. Additionally, you also need to choose a detector with the right features for the intended application. Readout of parts per million (PPM) – this is a measure of the severity of the leak. To know the severity of the leak, you will need a detector with a digital readout. This will dictate the required response to any refrigerant leak. Proper positioning of sensor (S) – depending on the type of refrigerant you are monitoring, the sensors need to be positioned correctly. Ammonia, for instance, is lighter than air. As such, ammonia sensors should be positioned at the ceiling. Multi-stage Alarms – the alarm system in the detector should give you an idea of the severity of the leak. As such, different concentrations of the leaked refrigerant should trigger specific alarm responses. As an HVAC technician, you often rely on your equipment and tools to diagnose and render the right remedy. Based on the intended application, your choice of the right refrigerant detector will vary. Your preferred models should be highly sensitive, portable, customizable, versatile and of the right type. 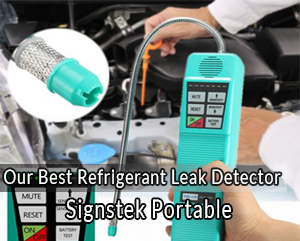 This guide will help you choose the best refrigerator leak detector in the market.